Publicis Groupe, in the wake of its failed merger with Omnicom, today unveiled management reorganization that includes the spring 2017 retirement of CEO Maurice Lévy and Saatchi & Saatchi global chief Kevin Roberts. The announcement actually extends Lévy's reign at the top, a job he said he was retiring from as long ago as 2011. As for Roberts, on Jan. 1 he'll be succeeded by Robert Senior as CEO and Chris Foster as chief operating officer. Senior has been Saatchi’s EMEA chief executive while Foster had the role of chairman and chief executive of Saatchi Asia Pacific. The appointment of Senior had been expected, as he had previously ascended from a top role at Fallon to help lead an alliance between Fallon and Saatchi. That alliance began in 2007. When Senior and Foster assume their new roles, Roberts becomes executive chairman of Saatchi & Saatchi/Fallon and "head coach" at the holding company, tasked with “inspiring and motivating the groupe’s top leaders,” Publicis Groupe said. Currently, Roberts is the longest standing global CEO of a creative agency, having assumed the role in 1997. The shop's top two accounts are Procter & Gamble and Toyota. The No. 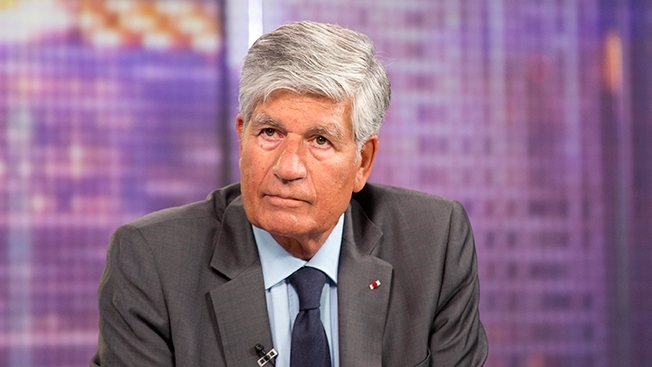 4 holding company's announcement, which came after a supervisory board meeting in Paris yesterday, did not indicate who will succeed the 72-year-old Lévy. As part of the current changes, the Paris-based holding company has expanded its top management board, the Directoire, and Naouri is being dropped. The following executives are being added: Laura Desmond, CEO of Starcom MediaVest Group; Steve King, CEO of ZenithOptimedia; Arthur Sadoun, CEO of Publicis; and Rishad Tobaccowala, chief strategist of Publicis Groupe. The holding company said that the additions will "lead the way for a new generation at the helm of the Groupe.” While speculation is that Lévy's successor will come from that “new generation,” observers have previously doubted that a non-French exec would get the job. Sadoun is the only Frenchman in that group. In addition, Publicis Groupe's VivaKi media unit has been split into divisions: VivaKi Exchange, under CEO Simon Pardon and VivaKi Data, which will be run by Stephan Beringer. Beringer takes over from VivaKi CEO Frank Voris, who becomes CEO of Re:sources and has oversight of the company's shared service centers and internal IT. The position of VivaKi chair will alternate annually between Starcom MediaVest’s Desmond, who assumes the initial term, and ZenithOptimedia’s King, with some sources wondering how well that division of duties will work between two corporate execs vying for position within Publicis. Some observers also question how much the executive reorganization actually changes operations at a company Lévy has run since 1987, following its founder Marcel Bleustein-Blanchet. During the merger talks with Omnicom, speculation grew that certain Publicis Groupe execs had grown disenchanted about their roles in the combined company and were weighing prospects elsewhere. The company plans to make a presentation to investors, providing more details about its growth strategy, before the end of October. French investment bank Natixis expects that event to be revealing about Publicis Groupe's future. "This meeting looks like an important turning point for the group, as it will likely set out its strategic direction for the next three/four years to be continued by Maurice Lévy's successor(s)…It will be an opportunity for Publicis to resolve its strategic dilemma and choose between a technology and services positioning," analysts Jerome Bodin and Pavel Govciyan wrote in a new piece of research.